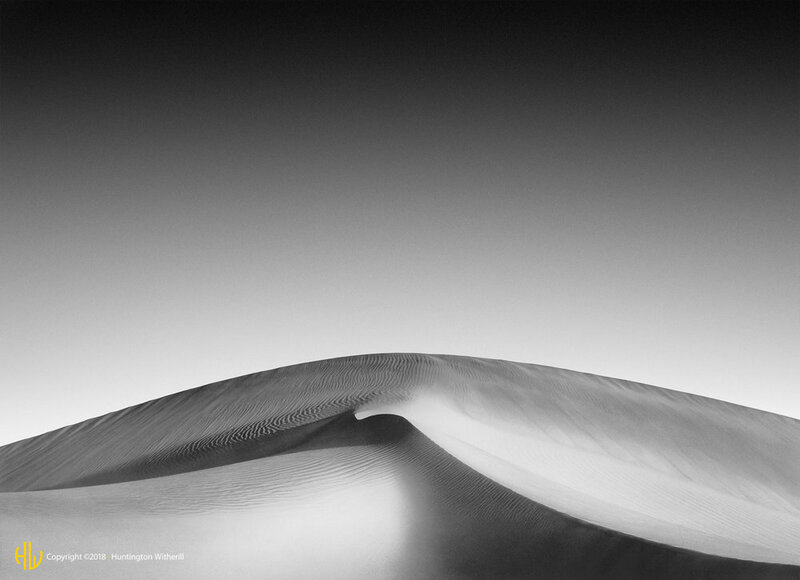 Brooks Jensen: I first became aware of your work a number of years ago, quite honestly I don't remember which gallery I was in now, but it was one of your high-key sand dune images. These images have almost become a signature of yours. More recently, I discovered the botanical series that we're publishing in this issue of LensWork Quarterly. Obviously you have your fingers in a lot of different "photographic pies," with a lot of different subject material. Tell us how you choose your subject material. Huntington Witherill: For me, one of the most important aspects of photography is the fact that a photographer is dealing with light, and secondarily dealing with subject matter. I've always approached subject matter as a secondary concern to the light. Most of the subject matter that I have photographed is of course subject matter that I'm attracted to. For example, I do a lot of landscape work because I enjoy being outdoors. Initially, I got interested in photography through having taken family camping trips each summer as a child. Although I couldn't articulate it at such a young age, the light affected me and I was moved by what I saw. I wanted to record it in some fashion. It may be a poor analogy, but a trash bin can appear quite transcendent if the light is just right. Conversely, Yosemite Valley can look quite bland if the light is not just right. The light defines the photograph more so than the subject matter. I have several different series' of photographs which deal with a variety of subject matter. But, I approach all these different subjects with the same concern for the light and how it's reflecting off the subject and how it actually defines the objects being portrayed. BJ: You've been doing photography for a long time as I recall. HW: Well it seems to me a long time, close to thirty years. I started just prior to 1970. BJ: You have a reputation as one of the definitive black and white fine art printers. Of course, when you talk about light however, you have to admit that it is more than a monochromatic energy. Do you shoot color? HW: I shoot very little color. Recently, through my interest in digital imagery I've become more interested in color. But frankly, I find I have a hard enough time with black and white. And, my passion is black and white. BJ: There's that word passion again that seems to come up so many times in LensWork Quarterly. HW: Passion in photography, for me, has a lot to do with my background in graphic design. I had training in college in two-dimensional design and it had a profound affect on me. I like to look at the world in terms of negative and positive space, different planes of focus, gesture of line‚ that sort of thing. I think it's much easier to represent those concepts in a monochromatic format, rather than in color. I find color a lot harder to deal with. With color, you still have to pay attention to all the design elements in a photograph but you also have that added dimension of color that you have to pay attention to. I see too many color photographs in which the color is really the only thing that's carrying the photograph; absent of color it wouldn't be very interesting. HW: I have that as well! HW: I started playing the piano when I was four years old and trained as a concert pianist. I played a number of public recitals in my early teen years. But, I had problems with stage fright and I quickly learned that I had neither the temperament nor the constitution to be a successful concert pianist. BJ: How did the graphic design part come in? HW: That's a funny story. I applied to the California Institute of the Arts. I went down for an interview and showed a number of my early photographs which were, in retrospect, quite muddy and not very good. Nevertheless, I was accepted into the school based upon those photographs. The first day of the semester I met with my counselor, who asked what I would be majoring in. Of course I said I was majoring in photography. He then told me that they didn't have a photography department! As an alternative, I decided I'd study electronic music and two-dimensional design. In retrospect, the studies in two-dimensional design were about the most important thing I could have done for my photography. I think it really has been of more help than any other study. BJ: When I think of a graphic artist I think of a guy with a pencil trying to figure out layouts on a poster. What exactly is two-dimensional design? HW: Well, two dimensional design is basically dealing with two-dimensional space, the organization of positive and negative space, the use of line, the use of form, repetition, symmetry, asymmetry - all of the issues related to a two-dimensional plane. BJ: That makes a perfect complement to what happens in photography. HW: Absolutely. I've often recommended to students that they take a two-dimensional design class. It teaches you many basic skills of composition and design in a practical way. There are lots of exercises that can really train your eye to pay attention to the design elements within the frame of a two-dimensional space. BJ: Some photographers execute the creative process, if I can use that term, by wandering around the world looking for something to photograph. Some photographers have an idea in their head and may even go so far as to sketch it and then create the photograph that matches what's in their head. As a designer, my suspicion would be that you are the latter? HW: That's an interesting concept but I would say that I am adamantly opposed to being the latter. I am probably more like the former. When I first started photography‚ particularly landscape photography‚ I would preconceive in my own mind what I wanted to photograph and how I wanted it to look. When I was out looking for a specific set of circumstances to photograph I was more often disappointed by the fact that I couldn't (as I like to say) force the image down the throat of my camera. At the same time I was passing by and ignoring all the really great photographs, because I was blinded by my preconceived notions. As to the botanical series, this is a still life series - they are constructions. I'm using paintings, other two-dimensional artwork, or cut stone as backgrounds or backdrops for pressed flowers. I layout a backdrop and arrange the flowers on it until I see something that looks promising as a composition. It's preconceived in that sense. So this particular series, in a way, is different than the way I would approach most other subject matter. BJ: Yes, but it is not as though you sat around your studio desk and said "Gee, I could do a circle thing with a line here." You haven't sketched it out the way a graphic designer might sketch out a promotional brochure or advertisement. It sounds more like you work in an intuitive process. HW: Yes, I think that's fair to say. It is kind of like a sketch but rather than sketching the flower here, I move it there. It's a discovery process in a way. Moving things along‚ all of a sudden, in an instant, it works for me as a composition. A lot of this particular series has to do with attempting consciously to avoid having the compositions look static. One of the things that's very difficult to do with still life photography is to maintain a sense of flow and movement in the composition, so that it doesn't look static. If you think about these photographs there is only about 1/64th of an inch depth-of-field to the photograph. They are very flat. I'm working with a 5x7 inch camera with the bellows drawn all the way out, looking at very small subjects. It can be a real challenge to get everything in perfectly sharp focus. At the same time, I don't want the resulting photograph to look flat. I want movement, dimension and depth. Arranging the composition in such a way that it doesn't look static is really the trick with these images. BJ: Let me ask you a question that gets at part of this idea of creative process. You are out photographing‚ arranging these flowers, wondering in the sand dunes, or in front of a graffiti wall and you see something. What you are doing is extracting out of the random world a photograph that has some aesthetic presence -that "sings." Some people find that an incredibly difficult process‚ the simple act of recognizing the "non-singing" from the "singing." You obviously can. So the question is: how do you know when it sings? Is it a physical sensation? Is it a mental sensation? Or is it a result of your training in graphic design? HW: Well, I think it is a combination of all of those things. When I'm out looking for photographs, what I'm really looking for are things that catch my eye. When I see something that catches my eye, I try consciously to intellectualize what it is about what I'm looking at, that is causing me to take notice. It might be something as simple as a repetitive pattern‚ seeing the same line occurring over and over right next to itself. Or, it might be that the light is reflecting off an object in such a way as to distort that object's known perspective. What is it that is attracting my eye? I try to determine what it is and then isolate that element within the two-dimensional frame. I work to eliminate everything else from the picture. If you look at my photographs you can start to see that I pay a lot of attention to what is going on at the edges of the frame. That's a very important element of any design composition. You'll notice that the main body of objects are often equidistant from side to side so that there is a symmetry, or more important, a balance to them. And if there is not a symmetry to it, you'll notice there are opposing objects which visually balance. For example, if you have a very hot object in one corner, you need something visually strong in another area to balance it out so that the eye isn't drawn out of the photograph. Another way I like to describe this is an analogy to music. I feel like photography is in some ways a lot like orchestration in music. With a photograph I can orchestrate the way the eye moves through a photograph by where I place things within the frame. Depending upon how the light is hitting those objects, I can actually force the eye to look at things in certain sequences and to follow certain paths. Your eye is going to look at this and then it's going to wander over and look at that. And, if I'm successful with what I am creating, your eye will take a little journey within the photograph. In so many photographs that don't work, one of the most prominent things that attracts your eye might be up in a corner with nothing to balance it. Your eye will wander right out of the photograph. You won't be engaged in it. These kinds of issues, which again come back to the two-dimensional design, are what I am working with. BJ: You tend to want to take things out or "distill" this element that caught your eye. There is a minimalist approach to that in the sense that you are looking to crop not only the square but also the content so that you can create a more powerful experience with a few elements. HW: Yes, I think that photography for me is a form of communication. Much like speech, saying things in the simplest way (which I probably will not be able to do here), is really the most effective way to communicate. I feel the same is true visually. If people are not able to absorb what's going on in a photograph, a lot of times it is because there is just too much going on and they can't take it all in. I'm a believer in simplifying and I think a lot of my compositions tend to show that. They have just a few lines. For example, this dune image is just a curved line. There are no mountains in the background, no clouds in the photograph. It's a very simple and straight-forward composition. In that respect, I think it helps to make it more successful. BJ: So, if there were mountains in the background, you might be predisposed to move them through careful camera positioning? HW: Absolutely. What attracted me to that photograph was the line coming up from the lower right toward the center, and then the gesture of it curling over the line which is coming up from the lower left. That is what attracted me to make this photograph. If you've spent time on the dunes in Death Valley you know that most of the time you can see the Funeral Mountains in the background. To make this photograph, I positioned the camera at a very low angle of view and consciously eliminated the mountains and everything else out of the scene. BJ: So when it comes to choosing subject matter, for you it makes no difference whether it is a flat flower on a stone background or incredibly 3-dimensional landscape that extends for hundreds of miles? Your process is the same. HW: Very much the same process. BJ: Do you translate the three dimensional world while looking at the ground glass in the camera or have you just developed the ability in your mind's eye to translate it mentally? HW: This is what the study of photography is all about. It's teaching your eye to see as the camera and the film see. After thirty years, I see this just by looking and I know what I can and can't do with a camera. I can usually tell whether or not it will work just by looking. I use to look through the camera and then hop around a lot- kind of a pogo stick approach. I'd set the camera here, and then move it there. I find I don't need to do that as much any more. I am usually able to isolate things just with my eye. Normally, I set up the camera one time and make the exposure. BJ: Well that's the thirty years of experience, developing an economy of motion! HW: I'm always reminded of the story when I was in Yosemite, at Inspiration Point taking a photograph and I noticed some tourists, discussing how mundane this landscape really looked compared to Ansel Adams' photographs of it. What they don't realize is that if you took them back to the actual scene Adams photographed, the scene itself probably wouldn't have looked that terrific to the eye then, either. It's what he was able to do with the medium‚ with the manipulation in the exposure, development, the printing and all of that - to interpret the scene from what it actually was to the eye, to what it becomes as a photograph. That's what photography is; teaching yourself to see as the camera sees. BJ: It's not just a minimalist approach that you use but in a certain regard we might almost say an abstract minimalist approach because you're abstracting or maybe better extracting out of the world a certain look that you choose to present rather than a documentary? HW: I think with most subject matter, that's true. From birth I've had very poor eyesight. I am very near sighted. But, I've turned this into an advantage. It's helpful for me to be able to look at things as big blobs of shape without a lot of detail in them. It helps distill planes of focus and different shapes of positive and negative space, so that I can more easily arrange them within the frame. It's a process of distillation that happens physically for me because of my eyesight. I often don't see all the details that other people do. BJ: I wonder if that could be employed as a specific strategy, for example by looking through pieces with frosted plexi-glass? It would be an interesting exercise to try. HW: Yes, there's a very simple way to get this effect. I recommend this to every student. Squint at the scene when you are looking at it. Squint at it until all the detail disappears. Look at the shapes to see how your composition works without the detail. BJ: Before we turned the tape recorder on to begin this interview, you'd mentioned that now because of your work with digital imagery that you're using a smaller camera. Has your approach to any of this changed now that you are using a different camera or is it simply different mechanics? HW: No, I think the approach has changed. I'm a great believer in view cameras and yet, at the same time I find the 6x7 camera to be an incredibly liberating experience. There is so much more freedom to experiment. With the 6x7 camera I feel like the puppy dog who can go around and pretty much pee on every bush there is! The smaller camera allows you to do things that you would normally never consider doing with a view camera because of its lack of spontaneity, and the fact that you just know it wouldn't work. But, that's where the growth and the magic come into photography‚ when you start doing a lot of things that you are just not sure of. I've found in my own work that I really start to feel as though I am repeating myself very quickly. I get bored with what I am doing and I want to do something different. The 6x7 camera has allowed me to just go crazy doing a lot of different things that I would normally never do, and there are some really interesting and, I think, important and thought-provoking ideas that come out of working that way. There is obviously a lot more trash involved because there are a lot more photographs that don't work. But, I've always believed that learning to see as the camera does, is a matter of taking the photograph and then really looking at the photograph. Growth comes by comparing the two‚ the mental image and the physical one‚ and determining what it is about that particular photograph that you are responding to. It has to be about the light and by remembering what that light was and trying to keep your eye peeled for that quality of light in other situations, you slowly develop the ability to see as the camera does. That's what got me involved with the high-key work. I took a high-key photograph, no doubt by mistake, and looked at it and thought it was an interesting idea. I decided to experiment and see where I could take it. I'm a firm believer in never getting too comfortable with what you are doing. BJ: Most of your work has been with a 5x7 camera for years. Now that you are playing around with 6x7, do you find yourself wishing that you had played around a little bit with the 6x7 in all those years that you were so exclusively focused on 5x7? HW: I hate to be nebulous, but in some respects yes and in some respects no. The 6x7 camera, as compared to the view camera, is the difference between playing the piano and the organ. They are two completely different instruments. Had I abandoned the view camera early on, I don't think I would have had the benefits that I have, to my way of seeing and my approach to photography. That camera forced me to approach photography in a certain way that was very instructive, very deliberate, and very important. It is kind of like learning a language‚ you have to learn the grammar first. In photography, I believe that needs to be done with a view camera. BJ: Do you find the smaller negative is a frustration? HW: Not really. I am not a big believer in the absolute necessity of impeccable craftsmanship, but don't get me wrong, craftsmanship is important. I believe that the technique need only be good enough to carry off the idea. I think many images don't need to be sharp; they don't need to be tonally clear. One of the images that I always like to refer to is: The Hand of Man, by Alfred Steiglitz. It's a very fuzzy, muddy looking image of a steam locomotive in a railroad yard. It's an exquisite photograph. It communicates something deep and profound to me. But, it's fuzzy, it's out of focus, it's grainy, and it's muddy looking. It is just good enough to carry off the idea. In this case, the technique is perfect as far as I am concerned. BJ: Let's go back to the botanicals for just a moment. Tell us a little bit about how this body of work started, when it started, is it still going, or is this a project that's completed? HW: I always like to think of these things in terms of never being completed. However, I've not approached this subject matter for maybe two or three years. I think it was started in about 1985, possibly 1988‚ the dates start to run together‚ but I'd say it has been about a ten year project. It really wasn't a project, per se. I didn't say I am going to go do this project. I approached this subject matter in the same way that I think Wynn Bullock approached subject matter. His work has been categorized by curators and critics: he had his nudes, his landscapes, the abstract work, the color work, etc. You begin to think he worked strictly sequentially. He didn't. To me, new subject matter is kind of like a new color to add to your pallet. I'll do landscapes one day and then I might come in and deal with a still life the next day. I can't say that it is a finished body of work, although it was exhibited a couple of years ago as a more-or-less complete body of work. BJ: It wasn't created with a portfolio in mind? BJ: So speaking of that approach, most of your images are intended to be individual images hung on the wall. You don't appear to be one of these people that work in project oriented, defined portfolios or that kind of thing. HW: I don't. I've always believed the photographic image should stand alone. I think of photographs almost as icons, not in the religious sense, but in the sense that the photograph can be a representation of a more complex and more expansive whole. BJ: You have so many different types ‚ I won't use the word bodies ‚ of work. Do you find it difficult to break out of the stereo type casting that limits so many photographers? HW: Of course! (laughs). If one works for a long enough period of time they are going to naturally gravitate toward a certain approach to the medium that is going to define them and there is no way to get out of that. However, the type casting is usually based upon a narrow-minded view regarding the particular subject matter chosen by the artist. This kind of categorization will limit you only if you allow it to do so. BJ: You said something that I think is critical. You said if you work at it for "a long enough time." This is a medium that requires a long time commitment to really master it. HW: You have to be absolutely passionate about it. It does take a long time. One of the most frustrating things for workshop participants is to come to the realization that it isn't going to happen this weekend, during the workshop. They are going to have to photograph and process film and print and do it for years and years. For some people, it comes quicker than others. I thought it took forever for me to get a handle on what was going on. Now, I have just a few photographs that are still meaningful to me that were done in the first four or five years that I worked. In fact, the first photograph I ever took still has meaning for me and I still find it to be a photograph that I would not be embarrassed to put on the wall. But it was kind of like putting that first quarter in the slot machine and getting a hit and winning twenty dollars. I put a lot of quarters in after that and didn't get anything. If you win once in awhile though, it's going to keep your passion going. Editing your work is the key, here. You've got to be a harsh critic of your own work. Even to this day, and I'm not ashamed to say it, if two to five percent of the images that I shoot become work that I am willing to put in a gallery, I find that to be a very healthy percentage.